A commitment to equity and diversity in schools and writing project sites often takes courage—and “courageous conversations,” as the South Coast Writing Project (SCWriP) puts it. For the past two years SCWriP has engaged in a series of “courageous conversations” about race and diversity. These conversations—often challenging—involve teacher-consultants and site leaders examining and interrogating their own practice, as well as the work of SCWriP itself. Based on the success of that open institute, SCWriP continues to hold bimonthly meetings to extend this work and build its capacity to support teachers of English learners. The ELL study group renamed itself “Courageous Conversations Continued,” or CCC, after a reading of the text Courageous Conversations About Race by Glenn Singleton and Curtis Linton (Corwin Press, 2006). Members set norms with the help of an outside facilitator, Jarrod Schwartz of the organization Just Communities, and continued refining these norms throughout the year. The goal of creating a more diverse membership and leadership within SCWriP was revisited and considered of paramount importance in addressing the issue of equity in teachers’ schools. At one meeting group members reexamined Ruby Payne’s A Framework for Understanding Poverty (Aha! Process Inc, 2005)—a book that led to widespread professional development financed by school districts—and the rebuttal article “Miseducating Teachers About the Poor,” by, among others, Heart of Texas Writing Project director Randy Bomer. In addition they read “Profoundly Multicultural Questions” by Sonia Nieto and “The Myth of the Culture of Poverty” by Paul Gorski. This examination of the literature was critical, Arias says, because it gave the study group members a sense of their own responsibility in sorting through what may be put forward, like Payne’s work, as the basis for classroom instruction. The work of the CCC inquiry group, Arias says, involved pushing past the idea that ELL instruction is “just good instruction”—questioning that premise, inquiring about the specific educational needs of students from diverse cultural backgrounds, and identifying ways in which the context of instruction and the culture of the classroom intersect. The group’s work gave participating teacher-consultants the tools necessary to view themselves as “advocates” of racially and linguistically diverse students. The site’s conversations went beyond changes in classroom practice, however; they also led to the furthering of long-standing conversations at the site, Arias says. As a result of those conversations, the site’s leadership is attempting to make changes that reflect the site’s commitment to equity and diversity. For instance, SCWriP is revising its summer institute readings to include more diversity. The site’s Spring Renewal meeting speaker is a woman of color, who will be talking about issues of diversity in schools. 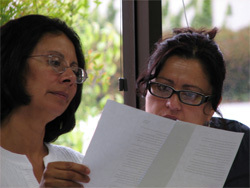 And during a February workshop, two of the speakers were bilingual teachers of color, and parts of the presentation were delivered in Spanish and English, reflecting the fact that there were a number of bilingual teachers attending the workshop who chose to write and share in Spanish. Or, at this moment…we can come together and say, “Not this time.” This time we want to talk about the crumbling schools that are stealing the future of black children and white children and Asian children and Hispanic children and Native American children. This time we want to reject the cynicism that tells us that these kids can’t learn; that those kids who don’t look like us are somebody else’s problem. The children of America are not those kids, they are our kids, and we will not let them fall behind in a 21st-century economy.